As I read the news release from the NEI/NIH yesterday morning, about the one-year results of the clinical trial evaluating the combination use of Lucentis with pan-retinal laser therapy to treat diabetic macular edema, prior to posting it online, and later, when I read the complete study as posted in Ophthalmology, the one thought that kept running through my mind was, why was Lucentis, at $2000 per dose chosen for the study, rather than Avastin at $50 per dose? And then I found out, when Andrew Pollack wrote the story behind the story later in the afternoon in the New York Times, “A Genentech Eye Treatment is Found to Help Prevent Vision Loss in Diabetics”. Organizers of the trial conceded that a major reason Lucentis was chosen was that Genentech agreed to provide the drug for free and contributed $9 million in additional financing – but only if Lucentis was used! "Obviously you can't underplay $9 million," said Dr. Ferris of the National Eye Institute, which is part of the part of the National Institutes of Health. But he said there were other factors as well, like a belief that Lucentis might have been the better drug. As shown in the study, nearly half the people whose eyes were treated with Lucentis, often in combination with standard pan-retinal laser therapy, had an improvement in vision of at least two lines on an eye chart after one year. That compared with only about 30 percent of those receiving laser therapy alone. And fewer people treated with Lucentis experienced a big loss of vision. "This is the first new treatment for people with diabetic macular edema in a quarter of a century," Dr. Frederick L. Ferris III, clinical director of the National Eye Institute, which sponsored the trial, said in a telephone news conference on Tuesday. The trial involved 691 patients, some of whom had both eyes treated, resulting in 854 total eyes. There were four treatment groups: One group got Lucentis injections into the eye as often as every four weeks, plus laser therapy. Another got Lucentis, with laser therapy used only after six months and only if needed. The third group got laser therapy plus injections into the eye of triamcinolone, a steroid sold by Allergan under the name Trivaris. The fourth group got laser therapy plus a sham injection. Some doctors criticized the organizers of the trial for testing Lucentis rather than the other Genentech drug, Avastin, which works in the same way as Lucentis. Avastin, approved for use in treating colon cancer is not approved for use in the eye, but has been used “off-label” since early 2005 and, because of its lower cost and anecdotal results and a few comparative studies, appears to work as well as Lucentis. According to Market Scope, an ophthalmic market research company, more than 60% of intraviteal injections used in treating AMD are done with Avastin, rather than Lucentis, probably because of the cost differential. As stated in the NY Time article, Avastin is undercutting sales of Lucentis, which totaled $1.1 billion in the United States last year. It is interesting to note that Genentech refused to supply either of the drugs or support the clinical trial, when the NEI/NIH agreed to fund a comparative study of the two drugs in treating neovascular AMD, the CATT Study (Comparison of Age-Related Macular Degeneration Treatment Trials). The CATT Study was initiated, without Genentech aid in February 2008, finished recruiting its 1200 patients in November 2009, and will report initial results in early 2011. It will be interesting to see what the effect on sales of Lucentis will be if the CATT Study shows little or no difference in the two drugs in the treatment of AMD. A news release from the NEI/NIH describes how researchers have shown that the combination of retinal lasers used with Lucentis are more effective in improving vision in the treatment of diabetic retinopathy that either lasers or drugs alone. The study’s one-year results were published today in Ophthalmology. Researchers have shown that ranibizumab (Lucentis) eye injections, often in combination with laser treatment, result in better vision than laser treatment alone for diabetes-associated swelling of the retina. Laser treatment of the retina has been the standard care for diabetic macular edema since an NEI-supported study in 1985 showed it to be beneficial. However, recent small short-term studies have revealed the visual benefits of eye injections of medications that block a chemical signal that stimulates blood vessel growth, known as vascular endothelial growth factor (VEGF). These studies have indicated that repeated doses of anti-VEGF medications, such as ranibizumab, may prevent blood vessels from leaking fluid and causing macular edema. The DRCR.net study, published online April 27 in Ophthalmology, confirms preliminary results and provides evidence of the treatment’s effectiveness in combination with laser therapy through at least one year of follow up. Find more information about this clinical trial (NCT00444600) at www.clinicaltrials.gov. For the complete study as published in Ophthalmology, use this link. I recently read this excellent overview of current treatment protocols for anti-VEGF treatments of wet AMD in the April issue of Refractive Eyecare, and asked the author and publishers for permission to reproduce it in this space. Permission was granted, and I hope you find it as interesting and well written as I did. To boost the efficacy and duration of anti-VEGF therapy, researchers are evaluating new dosing regimens, higher drug doses, and new medications. While current anti-VEGF drugs constitute an effective therapy for neovascular age-related macular degeneration (AMD), they are not a magic bullet. Their main shortcoming is their relatively brief duration of effect, which means that patients must receive monthly intravitreal injections; in addition, the efficacy of current anti-VEGF drugs leaves room for improvement. Clinicians and researchers are therefore continuing to explore the use of new treatment regimens, combination therapies, and higher drug doses. In addition, one new drug is currently in clinical trials and more are undergoing preclinical investigations. To test these new options, a number of studies are currently underway, including the HARBOR trial, the VIEW 1 and VIEW 2 studies, and the CATT study (See box). While none of these studies is complete, many are fully enrolled and should be providing clinicians with valuable data in the near future. Another way of trying to stretch the interval between intravitreal injections is by using a treat-and-extend protocol. Unlike a PRN dosing schedule, in which patients are monitored monthly even if they are treated less frequently, a treat-and-extend protocol stretches the interval between appointments. Using such a strategy, the patient is treated at every visit, but the time between visits is gradually increased if the patient's condition remains stable – i.e., no signs of vessel leakage, increasing edema, decreasing visual acuity, or blood or lipid on exam. In most cases, this approach reduces the number of injections by approximately 50% over a 1-year period. Finally, researchers are also considering the use of photodynamic therapy (PDT) as an adjunct to anti-VEGF injections. Although combination therapy does not seem to improve overall treatment efficacy, early data suggests that combining PDT with anti-VEGF medications may allow clinicians to achieve the same results with fewer injections. Because PDT adds another level of complexity to the treatment, however, it has not been widely adopted by clinicians. While PRN dosing, treat-and-extend protocols, and combination therapy can all help to prolong the duration of efficacy for existing anti-VEGF drugs, new drug formulations also hold promise. To test whether using a higher concentration of drug can provide additional benefit, researchers are currently studying high-dose ranibizumab. Other studies are testing novel agents such as VEGF-Trap to see if they provide greater efficacy and/or duration of effect. In terms of side effects, higher drug doses pose a few potential risks. Injection-related complications are a risk with any intravitreal drug, but these risks should be largely independent of the dose; since the high-dose formulation of ranibizumab is more concentrated than the low-dose formulation, clinicians can inject the same volume for both treatment groups. Thrombotic events such as heart attacks and strokes will be a concern, but the systemic drug levels should be significantly lower than those achieved following systemic administration of Avastin to treat cancer – by a factor of 100. In addition to the HARBOR trial, other major studies that should soon yield interesting results include the VIEW 1 and VIEW 2 studies, both of which are evaluating a new anti-VEGF agent, VEGF-Trap. Unlike ranibizumab, which is an antibody (Fab) fragment against VEGF, VEGF-Trap is a soluble receptor for VEGF. VEGF-Trap has a higher binding affinity than ranibizumab, which may improve its efficacy and/or duration of effect. VEGF-Trap also blocks platelet-derived growth factor (in addition to all isoforms of VEGF), which may provide some additional anti-angiogenic properties. Because drug development moves slowly through multiple phases, treatment for neovascular AMD over the next few years will be limited to drugs that are currently available – ranibizumab and bevacizumab – plus VEGF-Trap, which is well along in clinical trials. However, there are numerous agents in the pipeline that are being evaluated in preclinical and phase 1 trials. While we cannot predict which of these agents might prove clinically useful, the range of options undergoing study holds out the promise that one or more of these will prove effective. 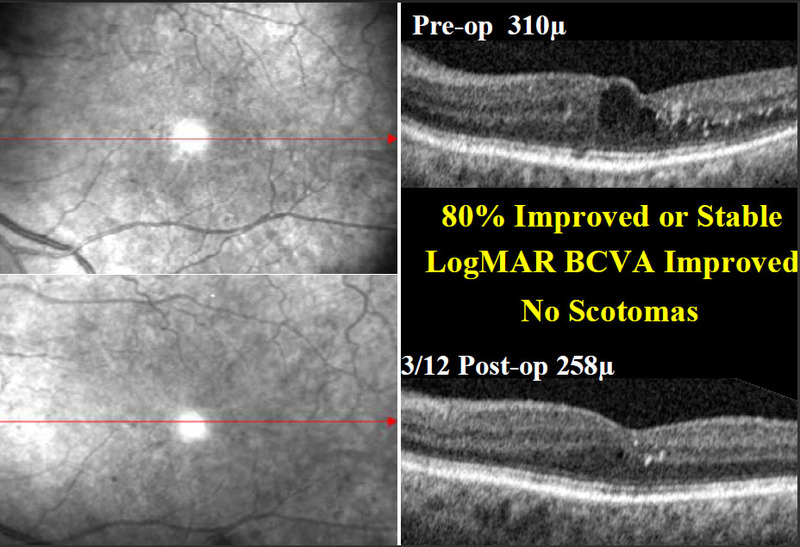 Finally, I believe the future of AMD treatment will involve a shift from treatment of neovascular AMD to earlier detection and treatment of non-neovascular AMD. 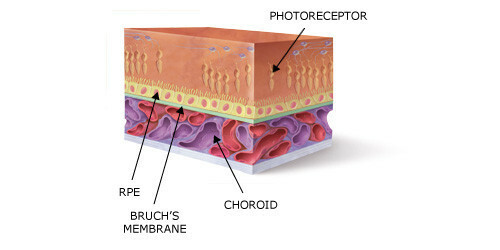 Specifically, researchers are currently examining ways to block inflammation, inhibit oxidation, and rescue photoreceptors. If such treatments are successful, then we might be able to prevent neovascular AMD from occurring. While anti-VEGF drugs are usually effective in the treatment of neovascular AMD, researchers and clinicians are still looking for ways to improve treatment. Since monthly intravitreal injections place a high treatment burden on patients, some studies are examining ways to increase the interval between treatments-such as PRN dosing, treat-and-extend protocols, and combination therapy. In addition, studies are examining the efficacy of other therapies that might offer greater efficacy and/or duration of effect, including high-dose ranibizumab and VEGF-Trap. Dante J. Pieramici, MD, is a retina specialist at California Retina Consultants, director of the California Retina Research Foundation, and a clinical assistant professor at the University of Southern California's Doheny Eye Institute. He is a consultant for Genentech, Novartis, QLT, and CoMentis. Refractive Eyecare’s managing editor Kay Downer assisted in the preparation of this manuscript. 1. Lalwani GA, Rosenfeld PJ, Fung AE, et al. A variable-dosing regimen with intravitreal ranibizumab for neovascular age-related macular degeneration: year 2 of the PrONTO Study. Am J Ophthalmol. 2009 Jul;148(1):43-58. 2. A Study of Ranibizumab Administered Monthly or on an As-Needed Basis in Patients With Subfoveal Neovascular Age-Related Macular Degeneration (HARBOR). In addition, the April 25th issue of Ocular Surgery News contains an article on the same subject: Combination Therapy May Augment Anti-VEGF Activity. It mentions other clinical studies underway for combination therapies and to extend the time between intravitreal injections, including the use of radiotherapy. Beginning in May, the NEI/NIH will begin recruiting 1000 patients in a cohort study, from among those participating in the AREDS2 clinical trial. Half of the recruits will be provided the Notal ForeSeeHome Device to monitor their progression from mid-to late-stage dry AMD to neovascular, or wet-stage AMD, while the other half will monitor their progress using standard care, including the Amsler Grid. The overall objective of this two arm randomized clinical trial (RCT) is to determine if home monitoring of participants at high risk of progression to neovascular AMD, using the comprehensive visual field and telemedicine solution based on the ForeseeHome Device in AREDS2 (referred to as the ForeseeHome comprehensive solution), improves detection of progression to choroidal neovascularization (CNV) when compared with standard care (use of the Amsler Grid). 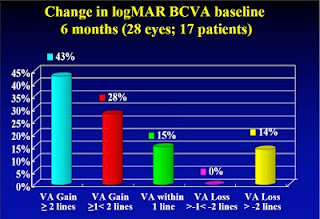 The primary outcome of this study will be to present best corrected visual acuity (BCVA) at the time of CNV diagnosis. 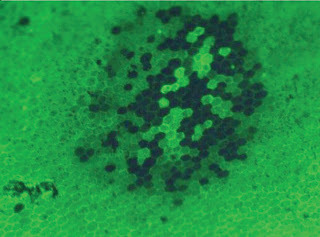 Secondary outcomes include time to confirmed CNV diagnosis, lesion size, lesion location (extrafoveal, juxtafoveal, or subfoveal), lesion type (occult without classic, predominantly classic or minimally classic), sensitivity and specificity, and BCVA following three consecutive months of treatment and twelve months after the initial start of CNV treatment with an intravitreal anti-VEGF agent using either ranibizumab or bevacizumab. A further secondary outcome will be to determine if vision can be preserved by earlier detection of CNV as compared to its detection at a later stage with standard care. The study is planned to run for two years and is expected to be completed by December 2012.
o participants in the device monitoring arm will receive a packed device at home, with instructions to install and connect the device to a modem as well as instructions for daily use of the device. o Standard care instruction per clinic routine for home vision monitoring (Amsler Grid) to detect progression of AMD. * 1. Male or female Age-Related Eye Disease 2 (AREDS2) participant 55 years of age or older who is actively being followed in AREDS2 and is expected to continue until the end of AREDS2. * 2. Participant must be English speaking and understand and sign the protocol's informed consent document. * 3. Participant does not have advanced AMD (neovascular AMD or central geographic atrophy) in at least 1 eye. The eye(s) that does not have advanced AMD must have at least intermediate AMD and will be the study eye(s). * 4. Participant must be able to successfully demonstrate their ability to comprehend instructions and use of the ForeseeHome device (a ForeseeHome device will be available at the clinic for the participant to demonstrate their ability). * 5. Participant must have a working phone land line in the participant's main residence. * 6. Participant's address to which the ForeseeHome device will be sent, if randomized to the device monitoring arm, must be located in the U.S.A.
* 7. Study eye(s) must have best corrected visual acuity 20/60 or better (at least 54 letters). * 8. Ocular media sufficient to allow adequate quality fundus photography. * 10. Participant must consent to be examined by the study ophthalmologist when changes in symptoms are detected by the home-device or by standard of care or when unreliable test results occur during the usage period. * 11. If randomized to the device monitoring arm participant must take the device with them if staying somewhere else other than their primary residence for 7 days or more. * 12. Participant has some experience using a computer. * 1. Participant has evidence of macular or retinal disorders other than AMD in the study eye(s). * 2. Participant has known adverse reaction to fluorescein dye. * 3. Participant is seen at the clinic more frequently than every 4 months. In November 2007, just prior to that year’s AAO meeting, I learned about a new laser that had the potential to alleviate the early stages of age-related macular degeneration and other retinal diseases including diabetic maculopathy, caused by compromised Bruch’s membrane. 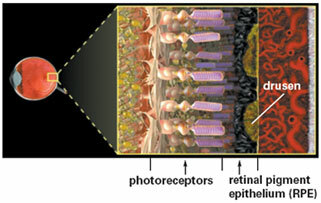 The laser-based therapy was called ELLEX’s 2RT (Retinal Regeneration Therapy). The theory behind the therapy was based on research conducted by Professor John Marshall at St. Thomas’ Hospital of London, and his colleague Dr. Ali Hussain. They found, after experimentation, that a specially-built Q-switched doubled YAG laser (532 nm) operating at 3 ns pulses, could be used subthermally to trigger a renewal process of the retinal pigment epithelial (RPE) cells, a sort of biostimulation, without damaging the overlying retina, including photoreceptors. This caused the RPE to migrate and release matrix metalloproteinases, enzymes, which act to clean up Bruchs membrane. The scientists were able to demonstrate and measure Bruch’s ability to transport water and chemicals and thus rejuvenate the retina. In November 2008, Ellex released the six-month clinical study results of the first trial. In this clinical study, conducted at St. Thomas’ Hospital in London by Professor John Marshall, 23 patients (38 eyes) with newly-diagnosed diabetic maculopathy and/or macular edema were recruited and treated with Ellex 2RT. Seventeen patients (28 eyes) completed the six-month follow-up examination. Patients are being followed for one year. Postoperative testing includes optical coherence tomography and microperimetry. 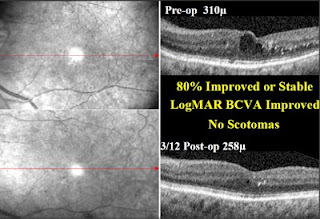 At the six-month follow-up, for the17 patients (28 eyes), the LogMar visual acuity had improved by two or more lines in 43% of eyes and between one and two lines in 28%. It remained unchanged in 15% of eyes, and deteriorated by two or more lines in 14%. Central macular thickness decreased by more than 5% from baseline in 46% of patients, remained stable in 39%, and had an increase of more than 5% in 15% of patients. The number of hard exudates decreased in 41% of eyes, stayed stable in 43%, and increased in 16%. Vascular leakage decreased in 55% of eyes, was unchanged in 31%, and increased in 14%. Slit-lamp ophthalmoscope microperimetry confirmed that photoreceptor function was not affected by the laser treatment. No adverse effects occurred during the study period. Since the release of preliminary clinical results in 2007 and of the six-month results in 2008, Ellex has initiated a series of pilot clinical studies aimed at evaluating the clinical efficacy of Ellex 2RT for a number of indications, the most important of which is age-related macular degeneration (AMD). The studies are making good progress, with eight prototype systems currently in use throughout Australia and the United Kingdom in these studies. Patient recruitment is nearing completion in two of the key pilot studies, with follow-up planned over a 12-month period. Studies focused on diabetic macula edema (DME) and proliferative diabetic retinopathy (PDR) are being undertaken in collaboration with the Royal Adelaide Hospital at three study sites. A major benefit of these studies is that they include control groups, allowing Ellex to more accurately benchmark the effect of Ellex 2RT treatment against conventional laser treatment. A third study, focused on early AMD treatment, is being undertaken in collaboration with the Royal Victorian Eye and Ear Hospital, a major Australian teaching institution, under Professor R. Guymer. Ellex will present preliminary results from these studies at the 2010 ARVO meeting in May. Once the results from this round of pilot studies have been fully analyzed, the company will evaluate the opportunity to undertake a multi-center randomized study, and look to expand their study sites beyond Australia and the UK. In addition, as announced earlier this month, Ellex has sublicensed the SRT (selective retinal therapy) patent, U.S. 5,549, 596, from Massachusetts General Hospital, and can now enter the U.S. market with this technology. Can Early Laser Therapy Delay Disease Progression?, John Marshall, Retinal Physician, September, 2009. Ellex Medical, the company behind the Ellex 2RT Retinal Regeneration Therapy for treating AMD, announced today that it had sublicensed Mark Latina’s SRT (selective retinal therapy) patent, to allow it to market its 2RT treatment in the United States. This same patent by Dr. Latina, is the basis for his SLT (selective laser trabeculoplasty) and SRT therapies. The patent, Selective Laser Targeting of Pigmented Ocular Cells (U.S. Patent 5,549,596) was issued by the Patent Office on August 27, 1996 and assigned to Massachusetts General Hospital. Under the terms of the agreement, Ellex has been granted non-exclusive rights to the retinal aspects of the SRT patent. Lumenis also holds rights to this patent for the marketing of both its SLT and SRT lasers. Previously, Ellex had been prevented from entering the US market with Ellex 2RT due to this patent; however, with the sublicense agreement now in place Ellex customers in the US will be able to use Ellex 2RT for the treatment of retinal disease. The Intellectual Property (IP) pathway for Ellex 2RT is unencumbered outside of the US, and the Company has filed for four international patents related to the Ellex 2RT Program. Ellex CEO, Mr. Simon Luscombe, said that the sublicense agreement was a major milestone, allowing the Company to proceed with a definitive plan to launch Ellex 2RT in the US market. “The next phase of the Ellex 2RT Program will focus on undertaking further clinical trials, and on obtaining key regulatory approvals for the Ellex 2RT product range”, commented Mr. Luscombe.